The Minister of Information and Culture, Alh. 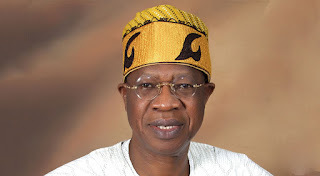 Lai Mohammed has taken a swipe on the Peoples’ Democratic Party (PDP) over its criticism of the All Progressive Party’s (APC) led government for the poor state of the country’s economy and depreciation of naira, saying that the PDP lacks the temerity to insult President Buhari and the citizens for their failure in managing the economy in a transparent manner. The Minister was reacting to the comments credited to Deputy Senate President Ike Ekweremadu, that businesses may collapse in the next six months because the Buhari Administration has mismanaged the economy, which he said was the clearest indication yet that the PDP and its leaders are still in denial about the massive body blows they inflicted on the Nigerian economy. Mohammed, who spoke in a statement signed by his Special Assistant on media, Mr. Segun Adeyemi, insisted that the poor state of the country’s economy, especially the depreciation in the Naira exchange rate, is the direct consequence of the incomprehensible mismanagement of the economy and the mindless looting of the national treasury under the immediate past Administration, rather than pushing the blame on the Buhari’s Administration. ”If there was still any honour left among thieves, there is no way the leaders of a party under whose watch the nation’s economy suffered a monumental mismanagement and the Central Bank was turned to the ATM or piggy bank of a few people will have the temerity to insult a government that is working hard to turn things around or the citizens who are bearing the brunt of such mismanagement,” the Minister of Information and Culture, Alhaji Lai Mohammed, said in a statement on Sunday. ”It is now clear to all Nigerians that if the PDP had won the last general elections, Nigeria’s economy would not have survived one more month, considering the battering it received under the immediate past Administration. It is therefore unconscionable that those who should show contrition and hunker down to avoid public opprobrium are the same ones pointing an accusing finger at the Buhari Administration,” he said. ”Senator Ekweremadu complained about the depreciation of the Naira without telling Nigerians who ‘dollarized’ the Nigerian economy by bribing many individuals and groups with dollars during the last elections, thus inflicting a knock-out punch on the local currency. He also failed to tell Nigerians which government presided over the frenzied mop-up of dollars, either for ‘armsgate’ or for slush fund purposes, from the CBN to a point where it almost ran out of the hard currency,” he added. The Minister said even though the Buhari Administration met an economy that was in coma, it had refused to use that as an excuse for inaction, hence has been working hard on measures that will turn the economy around and greatly offer relief to Nigerians by lifting millions, not thousands, of people out of poverty through a massive social intervention policy.